Processing a Movie File with a Paint Action Sequence is fairly straightforward. First you either need to record a custom PASeq to be used for processing or import an existing PASeq preset. Then you can just run a single menu command to start the processing. The PASeq will then be used to process the movie frame by frame. You don’t necessarily have to open the movie you want to process as the Studio Artist source. However it is useful if you want to preview the processing prior to starting a complete render run or if you are building the PASeq from scratch. To open a source movie with a new canvas you just run the File : New Source and Canvas menu command. A standard file dialog will appear. 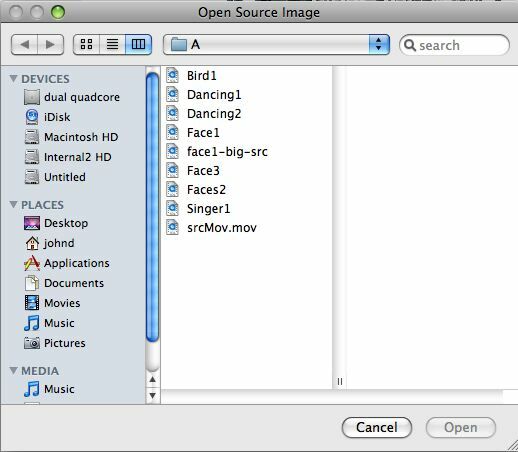 Use this file dialog to choose the source movie you want to process. After you choose the source movie you want to process a sizing dialog will appear. 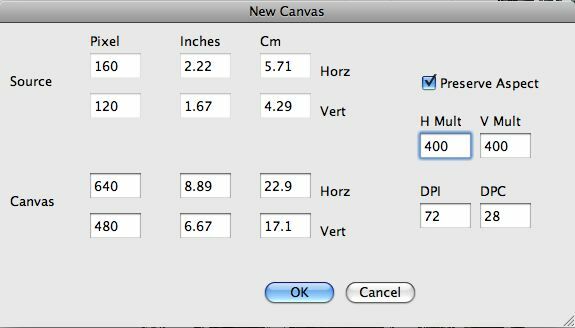 This dialog shows you the size of the source movie you have chosen and lets you specify the canvas size you will be working with. The canvas size does not have to match the source size unless you want it to. This is useful because you can work with small source movies and generate much larger processed output movie frame sizes with full resolution detail if you want to. So you could take standard def digital video and created processed footage at HD resolution. Choose the size of the canvas and resulting processed movie frame size you want to work with. 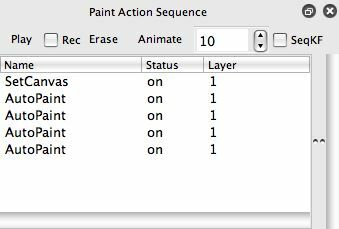 Now you need to either record a new Paint Action Sequence (PASeq) from scratch. Or import an existing PASeq preset. We will use an existing PASeq for this example. 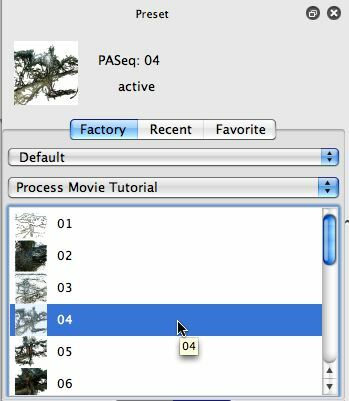 A good place to start is the Process Movie Tutorial presets in the Default PASeq preset collection. Use the Operation : Preset : Paint Action Sequence preset menu to bring up the Preset Browser palette in Paint Action Sequence operation mode. Choose the Default collection and the Process Movie Tutorial category. Now choose the particular preset you wish to work with. For this example we’ll choose the #4 preset example. If the Paint Action Sequence palette is not currently in the workspace use the Windows : Paint Action Sequence check menu to bring it into the workspace. Each action step in the PASeq is a specific Studio Artist operation. 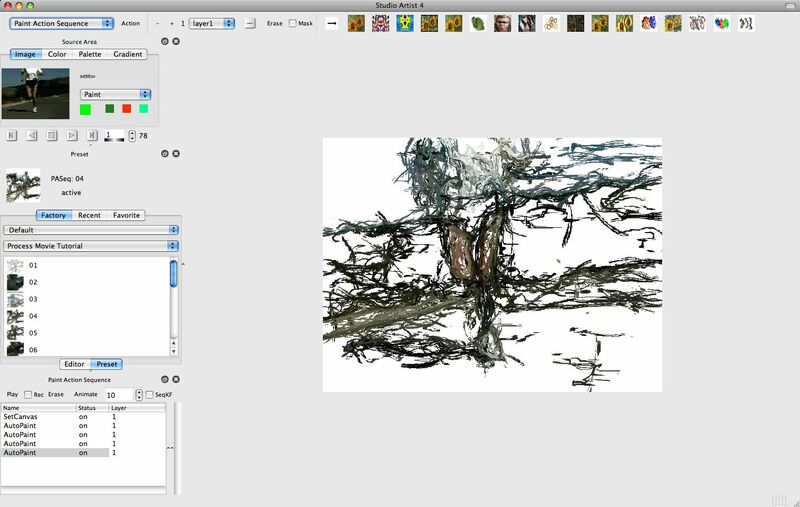 The example PASeq starts by setting the canvas to white in the first action step. 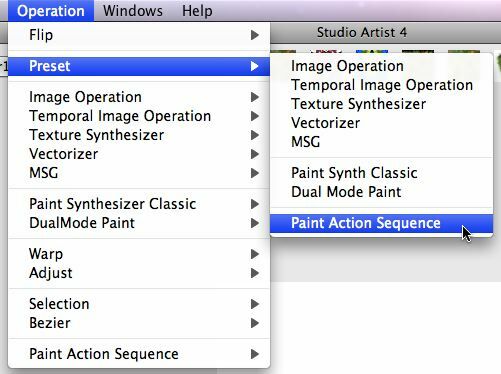 There are then 4 additional paint synthesizer AutoPaint steps. Each of these paint steps intelligently adds paint strokes to the white canvas to build a painted frame. You can press the Play button to run the PASeq on the current source movie frame to preview the processing effect for a single source frame. 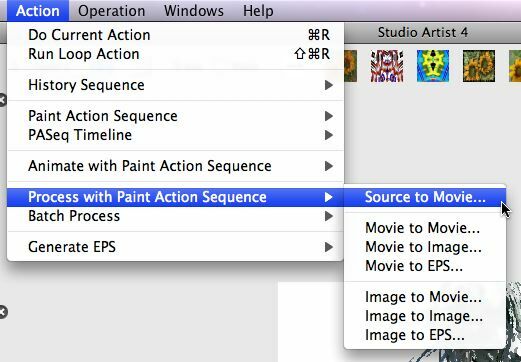 When you are ready to process the entire movie, run the Action : Process a Movie with a Paint Action Sequence : Source to Movie menu. If you don’t want to process your existing source movie there are other options like the Movie to Movie one that lets you specify which movie you want to process as well as resize the canvas. Choosing the Source to Movie option will use the existing source movie and canvas size. You will notice that there are other options for processing a folder of images to a movie or a movie to a folder of processed frame images, as well as Batch Process options that let you process a folder of source movies with a folder of PASeq presets. You will be asked to specify your output movie file name and location using a standard file dialog. Name your output movie with this standard file dialog. If you press cancel rather than ok an output movie will not be created but the actual processing will continue and be previewed on the screen until you manually stop it. This is useful if you want to preview processing several frames before committing to a complete render run. The movie processing will occur frame by frame until finished. The left side of the status bar at the bottom of the workspace will give you an indication of which frames are being processed. If you need to stop the movie processing you can do so by pressing the spacebar. You will get a dialog asking you if you wish to stop processing or continue. Press the appropriate button. Depending on your Studio Artist preference settings when the movie processing is finished it may be opened in Quicktime Player to preview. There is also a preference setting to pass through the source movie audio to the processed output movie which can be turned on if you want this to happen. Be aware if you do this that the output movie frame timing needs to match the source movie frame timing if you are doing this. Your Movie preference settings give you the option of passing through the source movie timing or using the movie compression dialog fps settings. Passing through the source timing is essential if you are passing through the source audio and will generate an output movie with exactly the same frame timing as the source movie. 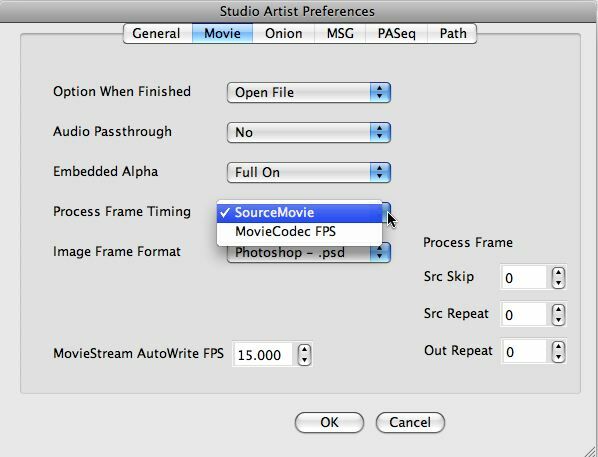 Using the MovieCodec FPS setting for Process Frame Timing will retime the individual movie frames to the FPS setting specified in the Movie Codec Settings dialog. This option is useful if you want to change the movie playbackrate in the processed output. The Movie preferences also include controls to skip or repeat source fames as well as repeat output frames. These can also be useful if you are changing the playback rate or number of frames in the processed output movie. Hand drawn animation is typically rendered at 10-15 frames per second (fps), so slowing down or skipping frames may be useful if you are creating auto-rotoscoped paint animation and your source footage was shot at 30 fps as an approach to cutting down on flicker in the painted animation. You can set your movie compression codec used to encode the processed movie frames using the File : Movie Codec Settings menu with brings up a standard Quicktime codec dialog. Depending on which movie compression codec you are using the amount of memory the processed output movie will use and the quality of the rendered frames can vary wildly. Many compression codecs are lossy, which means they throw away information in the rendered frame to use less memory when compressed. If you want the highest quality for your processed output movie you should use a lossless compression codec like animation codec at the highest quality. Be aware that doing so will create large memory footprint movie files. Many people use the same Movie Preference and Movie Codec Settings for all their work so they set the dialogs up initially and then forget about it since the settings are saved and restored for you.